Optimizes the performance of new lenses. This system software optimizes the performance of new lenses. If the system software version is Ver.3.10 or later, the update is not required. Select Menu --> Setup subpage 5 --> Version on the camera. The system software update takes approximately 15 minutes, therefore prevent your computer from going into sleeping mode. In case the computer would go into sleeping mode and the update would be interrupted, redo the complete update process from the start. Do not choose About This Firmware Updater from Firmware Updater Menu. Doing so may cause the updater software to crash, especially while updating. 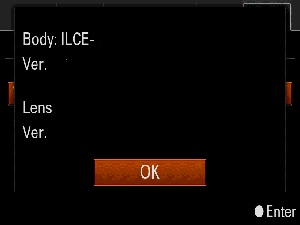 Double-click the [Update_ILCE5100V310.dmg] file you downloaded. - Do not connect the camera at this point. 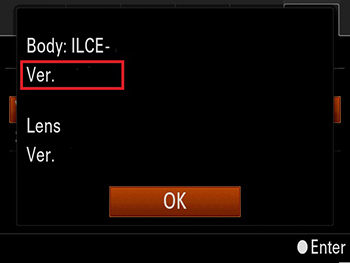 Double-click the [Update_ILCE5100V310] icon which appears on the Desktop. According to the instruction on the Firmware Updater window, select Menu --> Setup subpage 3 --> USB Connection on the camera, and check if Mass Storage is selected. 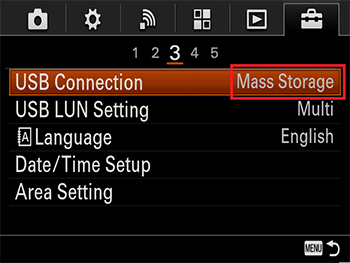 If another mode than Mass Storage is selected, please select Mass Storage . Click Next . The following screen appears. Confirm the system software version of your camera is Ver 3.10. On the camera select Menu --> Setup subpage 5 --> Version .